Last month, the prolific leaker @evleaks posted an unofficial press render of the Droid Mini in red. A few days after the leak, the Big Red announced the availability of the new colour option on its network. 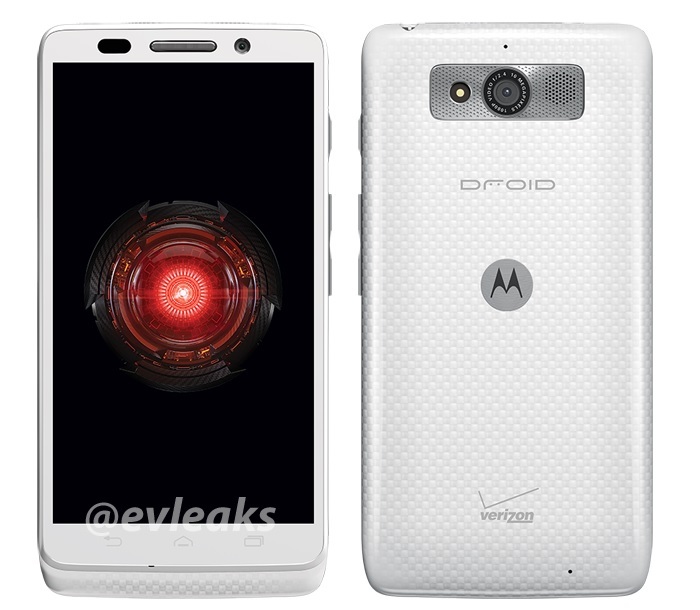 Now, @evleaks is back with another image, this time it’s the same Droid Mini for Verizon, but with a white paint job. This leak suggests that we might witness Verizon Droid Mini in white colour in the coming weeks. The miniature smartphone comes with a similar set of specifications as the original Droid Mini that was launched a few months back. The handset features a 4.3-inch HD display sporting a resolution of 1280 x 720 pixels. Under the hood, Droid Mini comes with a dual-core Snapdragon S4 Pro processor with a clock speed of 1.7GHz, 16GB internal storage, 10MP camera on the back with a 2MP front-facing camera for voice and video calls with 1080p video recording capabilities, 2,000 mAh battery and runs Android 4.2.2 Jelly Bean. Motorola already confirmed that the handset is expected to get the taste of Android 4.4 KitKat in the coming months. There’s no word about the date when the handset is expected to hit the shelves, but we’re guessing it will be before the holiday shopping season begins.